NOTICE: All images on these web pages, except external links, are Copyright by Duane Burleson , they may not be used in any form, public or private, without written consent. 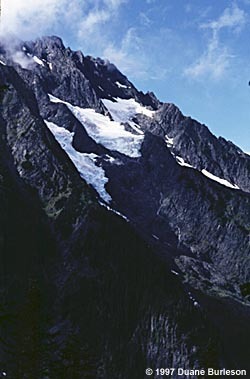 (Left) Glaciers cling to the side of Johannesburg Mountain opposite Cascade Pass trail in North Cascades National Park, Sept. 1997. 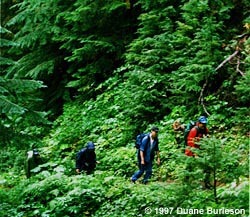 (Below) Hikers trudge through the lush forest on their way to Cascade Pass, not paying much attention to the second day of steady rain, on a trail with many switch backs that climbs steadily for 1,800 feet. Some hikers I met along the trail on their way back from Cascade Pass. It rained, more on than off, throughout the day and steadily through the night. The mountains in the background are hidden behind clouds/fog? that continuously blew through the valley. 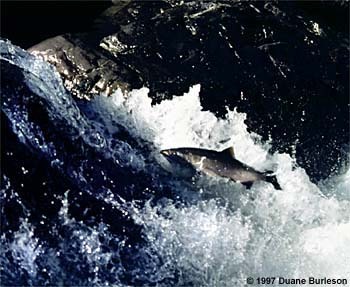 (Above) A salmon tries to make its way up the falls at Salmon Cascades on the Sol Duc River in Olympic National Park, returning to spawn after spending up to five years at sea. 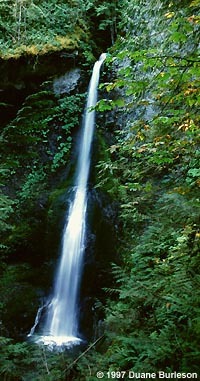 (Right) Marymere Falls, the tallest of the many falls in the park, can be viewed after a short hike from Storm King Information Station at the north end of park. 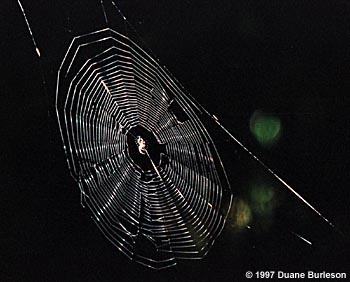 (Far left) A spider tends its web along the trail to Marymere Falls. (Below left) Because of dense ground covering it is hard for seedlings to get a start, so many plants germinate on fallen, decaying trees. (Left) Moss hangs from trees in the dense woods in North Cascade NP. 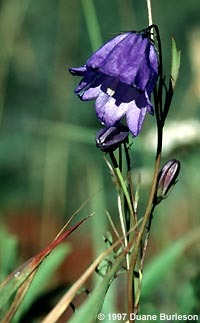 (Left) A Blue-bell of Scotland blooms on a mountain ridge in Olympic National Park. 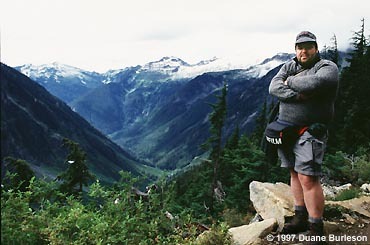 (Above) That's me on the Cascades Pass trail with glacier covered peaks in the background. Visit the North Cascade Glacier Climate Project for some very interesting information about glaciers. The North Cascades Glacier Climate Project (NCGCP) was established to monitor changes in climate that affect glaciers and glacial runoff. (Left) Glaciers cling to mountains. 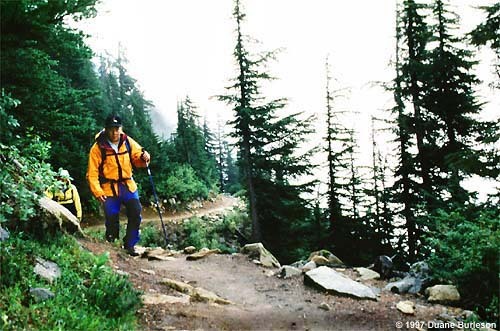 For more information, visit the official National Park Service web sites of North Cascades National Park, with information on Lake Chelan and Ross Lake National Recreation Areas, or Olympic National Park . North Cascades National Park Geology is a cooperative endeavor of the US Geological Survey Western Earth Surface Processes Team and the National Park Service. It includes the geologic story of the area and virtual tours as well as information on plate tectonics, rocks & minerals, geologic map and geologic time. For a virtual reality tour of Washington, visit the Virtual Reality Panoramas by G. Donald Bain. You can also select his other panoramas . Apple's QuickTime plug-in is required. Weather forecasts for Washington cities are available from The Weather Channel or choose another location's forcast. Use your web browser "back" function to return to this page. There have been visitors here since Oct. 4, 1997.